I took my two little ones to Ibiza for a yoga holiday and surprised myself with how much it has, as opposed to my raving days when I partied on the island so many times pre motherhood. 1. Breakfast: Santa Gertrudis - Bar Costa - get a sandwich with ham & cheese - best sandwiches on the island - homemade bread. 2. Go to the pirate tower with view on the magical island Es Vedra - It’s hidden, so you have to drive to Cala D’Hort and then follow the road up towards Eivissa - around 7800 m (from Cala D’Hort), You can turn right into a small private street (in front of a left turn of the main road - you also see the top of Es Vedra from there) - follow the road until there is a little roundabout where you can park - then follow the little rocky way and you will end on a beautiful plateau, 243 m above sea level, where you can look at Es Vedra… from there follow the way on your left up until you reach the pirate tower… MUST DO! 4. Take the boat to Formentera - best place for the kids to play in the turqoise water. I would do this from Cala Llonga at 9:45 am - you can easy park there and the boat takes an hour. Also a nice beach. 5. Wednesday: Visit - the Hippy Market in Es Canar (Punta Arabi) - it’s the biggest hippy market of the island. My kids loved it and we had to buy so many Ibiza clothes… After that you walk through Es Canar to a small Italian restaurant on the right side. This restaurant is just a few meters before the new Jacaranda lounge - actually also a nice place (not so good food), but a great pool bar with Sangria Cava (Champagne) and our kids loved to swim in this pool. 6. Nassau Beach Club Great beach where the kids can play. 7. If you love Sea Food - the Paella at Cala’Hort is great. 8. When I used to go to Ibiza pre kids I would head Cafe Del Mar, or Cafe Mambos. However, we found a great place to watch the sunset, soak in Ibiza with the kids. The kids loved to go out with us in the evening, so we went to some bars, lounge clubs that had live music or good DJ’s. I took the kids to Kumaharas which had DJs, acrobats, fire dancers, little shops, a lunge area to watch the sunsets, as well as a restaurant and a stall selling nutella pancakes into the early hours. The kids loved it dancing to the live DJ and saxophonist. Even after dark there were large lounge areas for us to chill out with the kids to listen to the Dj's and see artists. Top 3 homeschooling options, or raising talent that finishes school at 11am! Living in Switzerland is refreshing, there is no homework and they spend 2 years focused on giving children the skills and competency for life. The social, interaction and motor skills. My daughter just finished her 2 years at kindergarten so I was expecting that she would take a step up, but the the letter arrived through the door. So rather than put you through the maths, of course I spreadsheeted it. She has a whole 1hr and 25 minutes less in the school than when she was in kindergarten. I of course asked was there something special we were doing than other Kantons, why are their less hours. The teacher pointed that there were more lessons, but you can't misdirect from the facts on the spreadsheet. Now Switzerland for its greatness, also has its flaws and one of them is mothers working. As an entrepreneur and a working mother I am one of the few, the challenges and solutions can be found from previous blogs. This was a new one to me. So again I am sharing what I have found useful, as I have kids that are thirsty to learn. I turned to homeschooling, not because I am taking them out of school, they love school and we are truly integrated. If you are also looking for a supplement here is some of what I found, and I opted for Moving Beyond the Page. Moving Beyond the Page - The material is in age relevant curriculum, which engages children in critical thinking and fun without them realising they are learning. You don't need to prepare, you can print off the lessons and all the materials come. I also ordered the maths and reading. This gives myself and our Nanny a structure to navigate with the children. There are projects which the kids love, and we even extended on one to make a video of all the animals and habitats from the birds nest my daughter found to the zoo. The downside is if you buy the online version for some reason they limit it to a 90 day access. This is a little silly but compared to the other packages was the most engaging curriculum. k12 - This curriculum is following the US system, so it depends perhaps on a preference as an expat, perhaps there is a need or wish to align to the schooling system, It is a complete, integrated curriculum that has tool, exercises, assessment and support. It is less innovative that Moving Beyond the Page on the softer skills and cortical thinking as it is more a traditional schooling system. Oak Meadow - this approach was again imaginative focusing on learning through arts. I considered this as my kids have a lot of imagination. This is worth a consideration and knowing your child, may be the right mix. It delivers age appropriate curriculum from kindergarten to high school on an approach that enters around the child, with an emphasis on creative arts: drawing, painting, music, and handwork. Arriane is our nutritionist rock star leading our 4 week programme for busy Mums starting 24th June. Why I do what I do with AEM Health and Fitness, my purpose my passion. An unfortunate chain of events led me to discover my true passion and purpose in life; helping families and especially children live healthier and happier lives. Although I lost my beloved sister and mother to breast cancer and my father to a stroke after enduring Alzheimer's; I kept on moving forward. Even having personally defeated death on two occasions that hasn't detered me from what I know I am meant to do. The loss of my big sister was a turning point in my life, it made me re-evaluate my life and I realised that there was more to life than working 9-5 for a large corporate company. Although I am ever so grateful for all of the invaluable knowledge and the work experience it has provided me, my decision to leave conventional 9-5 working, long commute and corporate environment, is the best decision I ever made. From that point forward, I rigorously studied at the European Institute of Fitness to become not only a Coach, Nutritionist and Personal Trainer but I decided to further my studies to specialise in helping children who - like me growing up needed extra guidance and support, making healthy lifestyle and nutrition choices. I qualified as a Child obesity prevention and intervention practitioner in Children Nutrition. The full interview can be read in our Summer 2017 Magazine. My bosses boss, so basically a very inspirational senior executive woman in my company took me out for dinner just before Xmas, and asked me what I wanted. I always used to find this hard to answer because my ambition is not promotion, so I used to have to pad the response with right now I love my challenge, and the opportunity to work in what I love as a Mum and have balance. Whilst this is true, last year was a big year where I learnt to no longer hide. To no longer accept that I have to suppress who I am because my 'shadow beliefs.' I was scared that I would not be accepted. My second shadow belief was was can I really do this, and yes I can. So now I am out. She asked me to write a postcard to myself in 5 years time and share it with her if I wanted in January. This exercise became a gift to myself over Xmas, the other gift I fulfilled for my direct boss was to 'brand me.' Brand me is 'BlackGirlvTech,' it is all the things that are underneath the 'me' brand that I have created from my yoga, doctorate, HR, Tech and Start Up career, and are what I stand for, my purpose and the difference I make. I'm sharing my postcards, which leave me vulnerable but in that vulnerability may inspire other mothers to think about their life and what it looks like in five years time. This is better than any detox, because my focus is crystal clear. I hope this process helps you and be brave. Listen to your shadow beliefs, and respond then think about what you want to write to yourself in each of the areas of your life. On reading the latest research on the effects of pregnancy on the brain, I like many mothers thought that explains it! I'm not just imaging in it! The fact that even now my youngest is four I swear I still have a shocking memory, and I have to write things down or say 'I'll come back to you' because my brain does not have the capacity anymore to remember every number or detail. The latest research says that this is the effect of a huge burst of oestrogen, which lasts up to two years http://www.bbc.com/news/health-38341901, but there are times when I think I should see the doctor. Is it that I am just so tired, or busy remembering everything for the kids and the husband, that whilst everyone else has a piece of my brain, there is little left for me? However, my brain didn't just lose memory, it got a gift. The gift was that my brain was reprogrammed. It was almost a reset button that said really, do you really give a crap about that? What's really important in life? It grounded me to make choices based on values that would change their live and our lives, to live life out loud with purpose. If I just do not have the number or fact in my memory, it's okay to go back and check. It does not make you weak. I will have to do this in my oral defence of my doctorate. We know that a person's effectiveness is not their ability to memorise but to think, to solution and take action; this is what mothers do every day. I don't know if my grey matter will ever go back to pre-motherhood levels, but I am glad there is research that explains the challenge. Mothers have so much to offer because it reshapes are brains not just in memory, but purpose. What we may need is coping mechanisms or tools for memory. On our Saturday Share we went live on Facebook again in our community group, for anyone that missed to share handy tips. One in our house is felt tips. The kids tidy up but one of those annoying things is the lids on pens, and instead of throwing the pens out you can save them, or as my daughter said bring them back to life. On the 17th October we are launching three of the the first mothers rock interviews that we are publishing in our members magazine and via our you tube live channel accessible via our community. 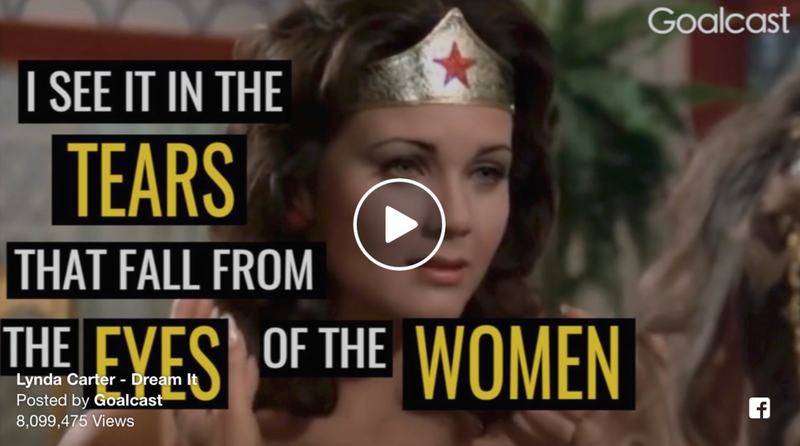 So as a prelude to our channel and magazine which will raise up and inspire with unplugged interviews with mothers, here are 10 TED Talks from mothers that inspire. You know that feeling after you bring a child into the world, that your life will never be the same. At the same time everything prior to that point almost becomes meaningless. You actually start to reassess the world. In one sense when my first child was born I became brave. In another I had to redefine who I was. I was not the same 30 something me. What am I doing? Does what I do mean anything? Am I even making a difference in this world? Is it worth it? Suddenly there is something bigger than you, that little person that you are responsible for; you want them to be the best they can be, to live in a world full of potential that is safe and sustainable. I had these big thoughts of how I could impact my daughter’s future world, and at the same time I was learning to be a mother. In addition to this new role, I continued to be: wife, lover, friend, and work colleague. The new role had an impact on all the others. If I did not take a step back I would lose me! That’s when I transformed, having a child changed me, I knew it was an opportunity to take that energy, that power that you have as a mother and know as you want your children to know ‘I can do anything’. I started to define just what that was to each one of my roles. As a mother being home for dinner and doing plays (not macbeth but magic rabbits, princesses, car races and dragons), and reading each night. To challenging my brain in my doctorate, which helped me to develop technology that automates chores saving mothers time, and research that understands what in people’s childhood makes them successful, and happy! The both aligned to giving me, and other mothers more time with our children, with our future and to have more memories than do administration and chores. I transformed into the best version of me I could be at each of the roles, but realised we cannot do everything. So the key was to align the roles to what I truly loved, what I was passionate about. To stop doing things that detracted from that, and to start and continue the things that aligned to what I loved in this world most. It sounds easy, but it was a journey to break down the mind set for example of ‘guilt’ and to accept help. I started to say ‘yes’ to outsourcing chores and ‘no’ to things that served no purpose or were meaningless. 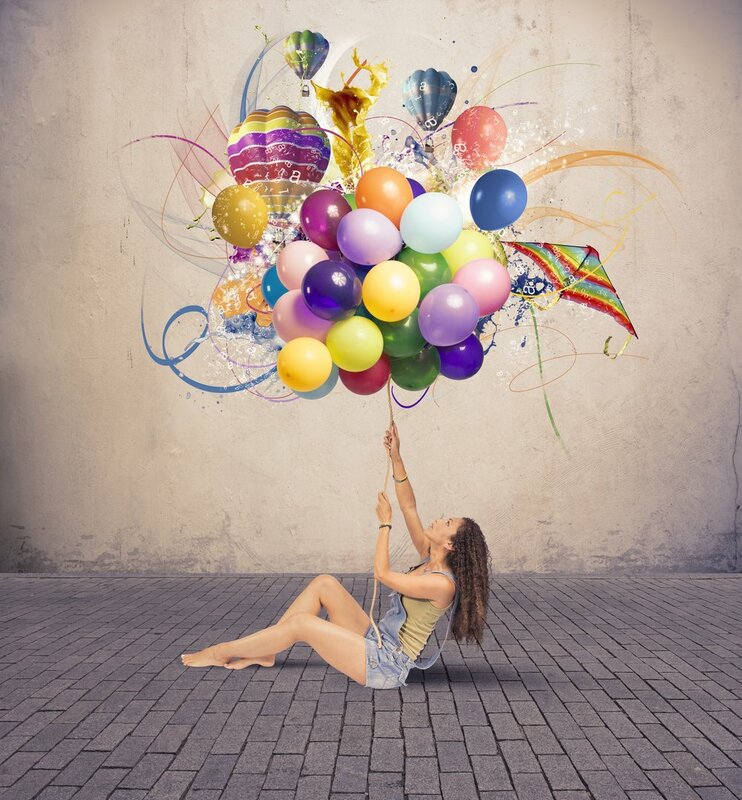 This transformation was broken down over 4 steps, a framework which allowed me to redefine my life, and make sure I was Living Life Authentically. I am now true to who ‘I’ am as a mother, wife, lover, friend and work colleague. I learnt that you can have that authenticity as a mother, where you give to each part of you. You have to be brave enough to take the step back. To admit I am not that same person as I was before kids, and take the opportunity to redefine you. I want to share this framework with other mothers so that can live a life that is authentic to them. To talk them through the framework and provide printable tools, that supports them. There is very little for mothers. This now changes Sign Up for your Living Authentically Webinar and Kit. I am building a community, tools and technology that is there for Mums. That pulls into question all the roles. Where those roles are out of sync, for example, “I’m not actually doing what I want to do in life,” “my friends and I don’t actually have the same values” or “I have no time for me” it creates a constant circle of dissatisfaction. In truth the day we become mothers it redefines us. That’s the time to take a step back and ensure we live life authentically. To lead an authentic Life as a mother means happiness, and it can be completed by four simple steps YEAH! On September 14th we will host a free webinar that takes mothers through these 4 simple steps, with printable materials that can be taken away and are there to support all mothers. If you want help and support via a community of busy Mum’s to live an authentic life sign up for the free webinar http://www.whatifihadapa.com/free-webinar-4-simple-steps-authentic-life/ here. Equipment: kitchen aid, peeler, sharp knife, chopping board, mixing bowl, desert spoon, non stick frying pan and a wooden spatular. First these fish cakes to me are a little piece of home with a Paleo twist. My Mum comes from a small island in the middle of no where called St Helena (15.9650° S, 5.7089°) with just over 4,000 people. One of the main dishes are St Helena fish cakes typically made with tuna or mackerel, and of course you can change the type of fish you use here. The most famous guest or prisoner of St Helena was Napoleon! Peel and boil 1 medium sweet potato until cooked. Drain, mash and put to the side. Finely chop the onion, parsley and chili, season well and fry in a pan until translucent. Scrape or mince the fish. To prepare the fish you can either mince it with a kitchen aid or alternative brand, or I tend to scrape the fish using a sharp knife. Scrape the fish with a sharp blade away from you. So layer by layer 1cm at a time. You could also ask the fish monger to do this for you. 5. Mix all the ingredients in a bowl and season more if needed to taste. Add additional flour if the mixture is too wet, it should be the consistency of a cake and you should be able to form scone like shapes with your spoon that hold together. 6. Form cakes with a spoon and fry in the pan in a little coconut oil. Dice the courgettes, pepper and separate the cauliflower into small stems. Dice the onion and carrots. Fry the onion, carrots, garlic and ginger with in the coconut oil down until softened and season with salt and pepper (approximately 5 mins). Add the red curry paste for 5 minutes. Add the rest of the vedgetables for approximately 5 minutes. Add the coconut milk and simmer for another 2 minutes and add the fresh chopped parsley. 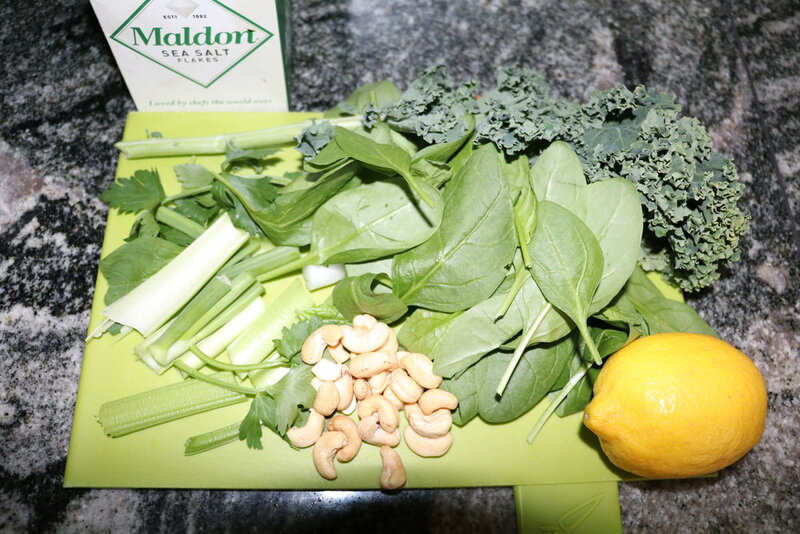 Ingredients for the super green lemon soup simply assemble them all. I use organic. For the days when you are working and going from meeting to meeting, call to call but your body needs that nutrition and energy this is my quick and easy hit. There are somedays where I need to say I just need to pee, as a mother working it's tough, so this is recipe and my nutribullet are my saviour. This is great for busy mums. Chuck the rest of the ingredients into the nutribullet except from the lemon and Nigella seeds. You need only the juice of the lemon. Then you have lunch in Max 5 minutes full of lovely alkaline vegetables and citrus fruit, and energy you could change the type of nuts you use from cashews to almonds. 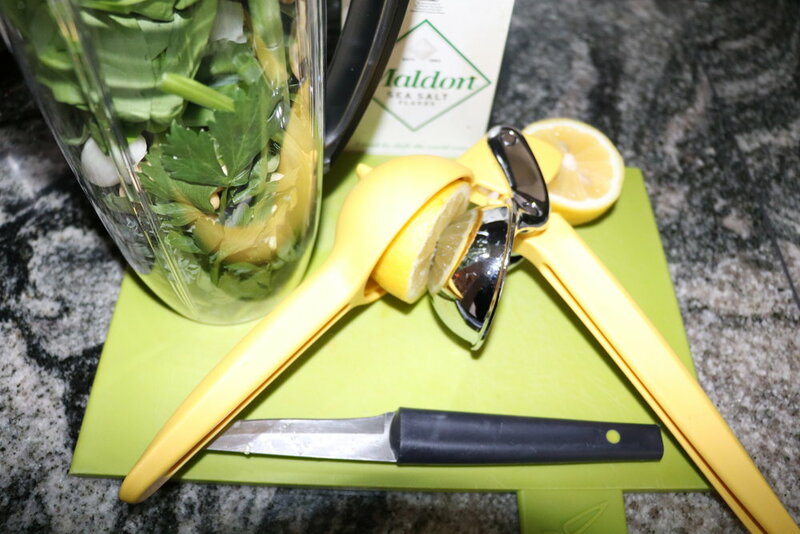 Equipment: Nutribullet, Lemon Squeezer (optional) you can use a fork if you don’t have one.